The recent cold snap across the U.S. has left many of us feeling a bit under the weather, and Google knows it. 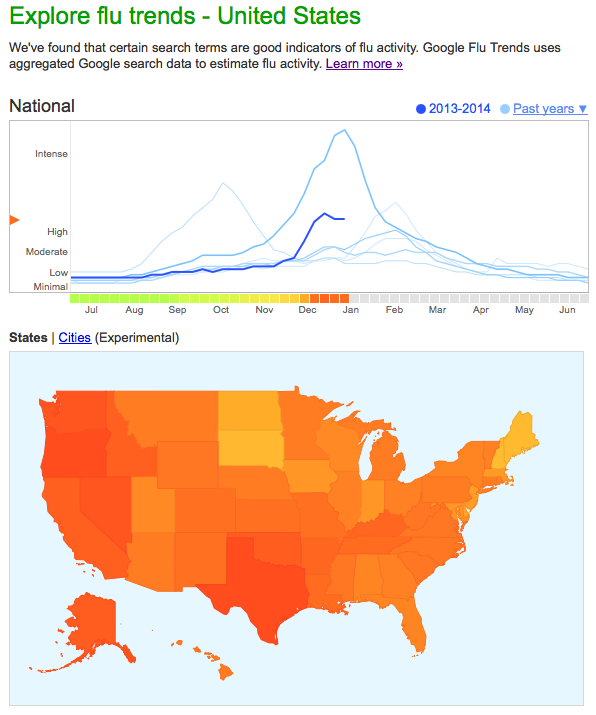 Google Flu Trends is an interesting, near real-time visualization that aggregates flu-related search data with flu information from the U.S Centers for Disease Control. Google.org, Google’s non-profit arm, found a close relationship between how many people search for flu-related topics and how many people actually have flu symptoms and mapped the results, ranging from minimal to intense. Through this unique collaboration, users can filter data and observe flu trends from the past several years across many countries around the globe. This entry was posted on Thursday, January 16th, 2014 at 5:06 pm and is filed under INFOGRAPHICS. You can follow any responses to this entry through the RSS 2.0 feed. Both comments and pings are currently closed.